The universal geo-information system having means of creation and editing the digital maps, execution of various measurements and calculations, overlay operations, constructions of 3D models, processing of raster data, means of preparation of graphic documents in an electronic and printed form, and also tools for work with databases. 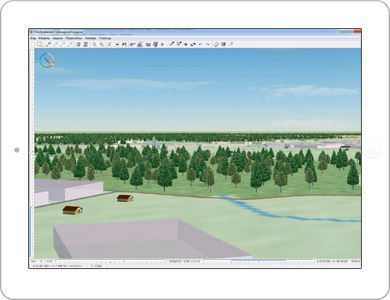 Construction of three-dimensional models of district, movement along it in real time. 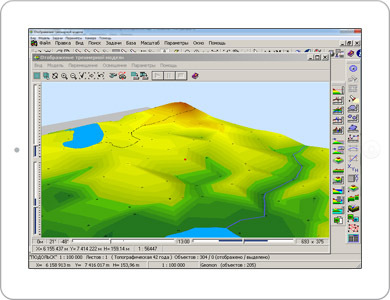 The surface of model can be formed with use of vector, raster or matrix maps. 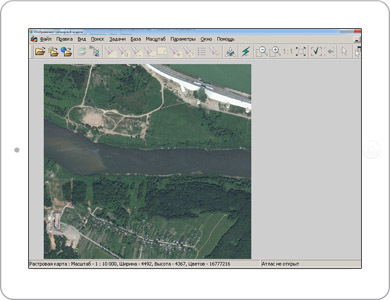 Building mosaic from any number of vector, raster and matrix maps. Support of multilayered matrix maps (geological), matrixes of a relief and matrixes of qualitative characteristics of district with their legends. Construction of orthophotomaps by materials of satellite surveying of the central projection, panoramic and slot photos, air photography. Construction of regular and irregular (TIN - models) matrixes of heights by vector maps or by a set of point measurements. Construction of crossings or unions of objects contours of one list with another. Construction of the common zone around objects presented in the list. Selection on a map of objects of one list having certain spatial connection with objects of other list (entering, crossing, adjunction, deleting within the specified distance and so forth). 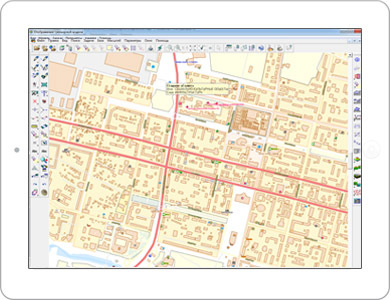 Tasks of the network analysis in GIS Map 2011 are search of the minimal path between knots in view of values of semantic characteristics of ribs of a network and a finding of objects within the specified distance from the specified knot (the graph of remoteness). 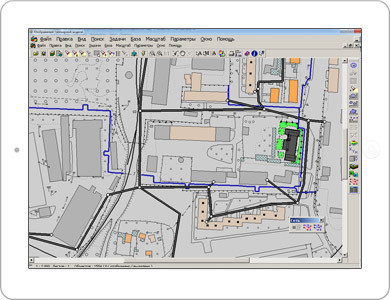 Intended for data processing land researches in office conditions, drawings of results of calculations onto an electronic map and formations of accounting documents by metric and attributive data. Set of applications for processing results of engineering-geological researches, for preparing and forming the drawings of engineering-geological columns and sections, for calculation of volumes and creating plans of earthworks. Support of the atlas of maps (fast transition between overlapped maps of different scales, systems of coordinates and projections). 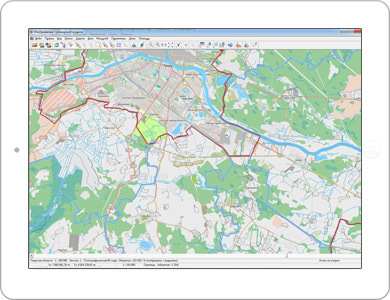 By means of the additional module - "MANAGER OF MAPS" convenient systematization of metadata about cartographical resources in your local network is accessible. Converting of data in formats: SXF, TXF, DXF/DBF, MIF/MID, SHP, KML, GDF, S57/S52, GEN, DGN, MP, UPT, RTE, WPT, RTE, PLT, EVT, XLS, TXT, GRD, TIFF, JPEG, SID, NITF, EPS, EMF, etc. Support of standard systems of classification and coding of maps, interactive setting of libraries of conventional symbols and programming of new primitives. Interactive designing of information systems on the basis of the built-in constructor of forms, reports, SQL-queries. There are realized the possibilities of formation of macros and queries, uniting of several tables of databases into one, link of map objects with the user forms is organized. Creation of diagrams on a map by values of semantic characteristics or by values of the chosen fields of databases tables. At creation of cartograms there is an opportunity of proportional and disproportionate distribution of ranges of values of attributive characteristics. Calculations on a plane and in space in view of distortions of projections, curvature of the Earth, three-dimensional coordinates, matrixes of heights and qualitative characteristics. Execution of overlay operations above multitude of objects. 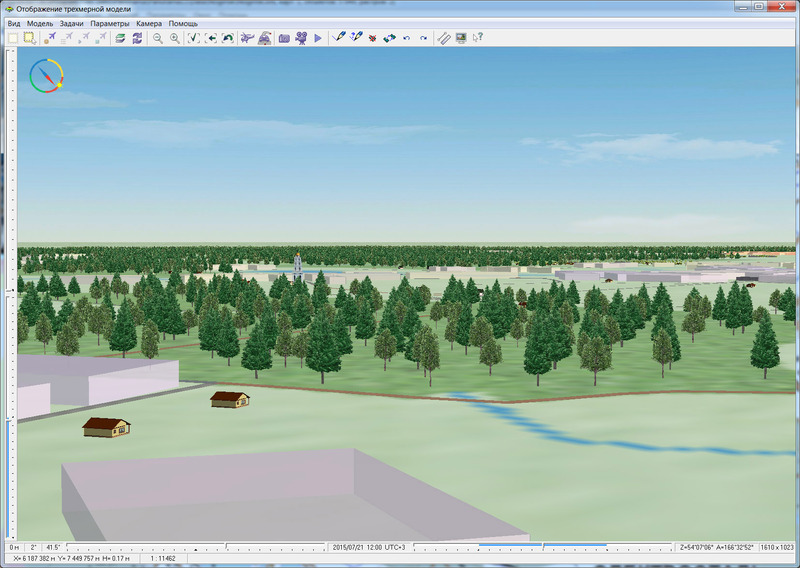 GIS "Map 2011" allows to create and analyze models of the surfaces reflecting change of the specified characteristic. 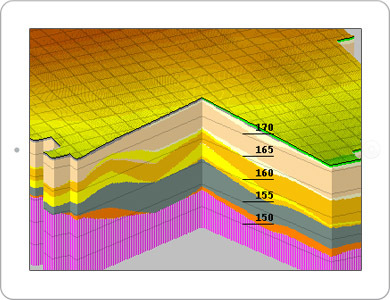 Surface model can display such properties of district as heights of a relief, concentration of pollution, quantity of rainfall, a level of radiation, remoteness from the specified object and others. 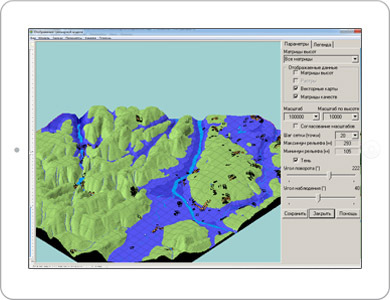 GIS "Map 2011" allows to create models of flood zones, using measurements of depths and data about the terrain - matrixes of heights (MTW), TIN-models. 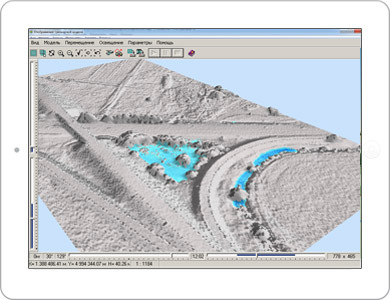 Creation and updating of digital maps, digital models of a relief and mathematical models of district according to data of air laser scanning and remote sensing of the Earth (RSE). Automatic arrangement of filling signs and labels, designing of points of an adjunction and crossing of objects. Division of big objects onto parts. Cutting of a map onto sheets for the atlas. Formation of out-of-frame bordering and a legend, allocation of OLE of-objects. Converting into graphic formats and split to CMYK. Creation, editing and search of the shortest routes by graph of a net. 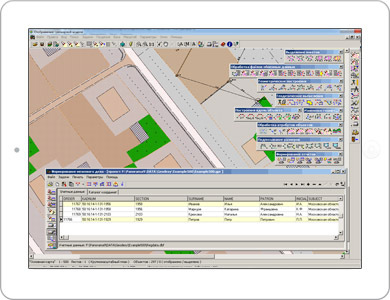 Graph of roads is created by the selected objects of a road net and represent the user map with edges and nodes. 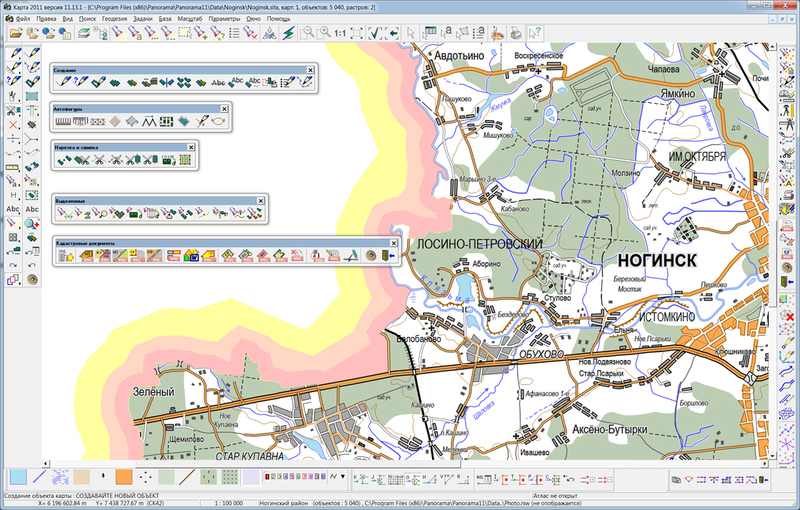 Displaying of own position on a map background. Recalculation of the coordinates received in systems GLONASS (PZ-90) and NAVSTAR (WGS-84) into system of coordinates of 42 year. Displaying of three-dimensional coordinates, speeds and an azimuth of movement, distance, an azimuth onto the specified point and other parameters. Displaying of the traversed path and a choice of routes for the further movement. Query of electronic maps and digital pictures of district onto the specified territory by liaison channels. Construction of a road net, solution of transport tasks. 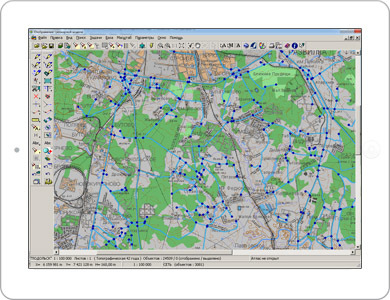 Support of the international standards and protocols of data exchange OGC WMS, WFS and TMS allows to receive any spatial information from services located in the Internet environment. 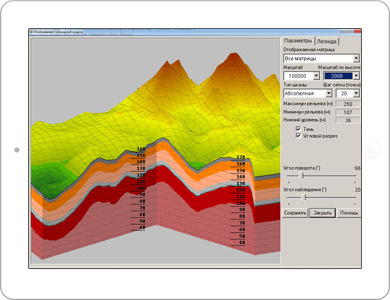 Complex of analysis of multispectral images is intended for calculation of statistics on channels and settings of displayed channels of a multispectral image. 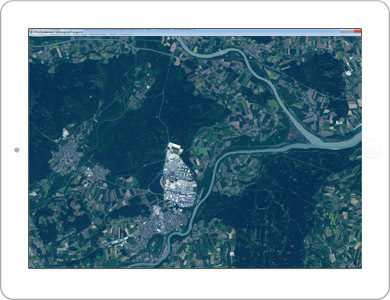 Multispectral images are processed in files of GeoTIFF format without additional transformation to internal RSW format. 1) For software of version 11.x in 64-bit OS you must install a special driver for electronic key to, which is not installed automatically when you install the software. Installation of the key driver is on the software installation disc, see: "\System\WinKey5-x64\". Before installing the key driver for 64-bit system, you must verify the absence of a previously installed version of Guardant driver. If the driver is in the system, you need to uninstall it, then restart your system and install a key driver for 64-bit systems.